The Dominican Republic is one of the most popular Caribbean getaways. At the Dream Suites Costa Dorada, you can walk into your very own timeshare and discover new vacation memories. The Dream Suites Costa Dorada is located on an oceanfront property that features a championship golf course, a stunning stretch of beach, two adult and one children's swimming pool, and a fitness center and children's mini club, so the entire family can stay active and entertained during the visit. Plus, for dining and drinks you can visit one of five on-site restaurants or the three bars, and catch nightly live entertainment without ever leaving the resort. These Dominican Republic timeshare resales feature one and two bedroom luxury suites ready to welcome you and your family with a relaxing, enjoyable atmosphere. You can wake rested every morning, ready to face a new day of fun and excitement. All suites have distinctive, dark wood furnishings set against a beautiful vista. You can stay inside at the air conditioned living room to watch a little cable TV in your down time, or gather outside in the shaded patio or porch to spend more quality time with your family. The full bathrooms in each suite include a luxurious Jacuzzi hot tub. 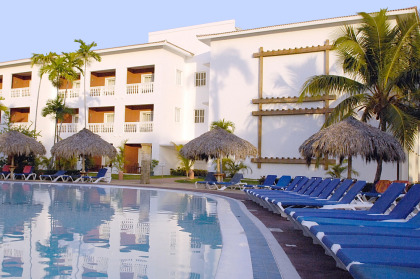 There's lots to do even off the resort with these Dominican Republic timeshare resales. It is located at the edge of the mountains, with thick foliage of coconut and palm trees everywhere you go. The ocean is just steps away, so you can pass your entire vacation gleefully at the beach with exciting water sports or underwater with scuba diving and snorkeling excursions. Or, if you prefer to relax and be pampered, why not take in the resort spa experience, followed by an afternoon filled with sea breezes and a drink on the beach? The Dream Suites Costa Dorada has everything you need to make your dreams of a tropical vacation come true. The timeshare accommodations are perfect for upwards of four to six guests, and combined with all-inclusive amenities across the resort, it's a perfect place to let all your cares blow away. Contact Dream Suites Costa Dorada- By Lifestyle Holiday Vacation Club Specialist Today!